"So for Christmas I'm making a slideshow of a bunch of family vacation moments and putting it on a DVD. I need help with cute songs to put in it." "I am making a DVD for my family for Christmas. It's a slideshow of pictures of my kids over the last year, and I'm going to back it with music. Any suggestions for some appropriate songs?" "I'm making a slideshow of pictures for my parents for Christmas. I've got all the pictures, but I need help with the timing. Default is set at 7 seconds per picture, which seems pretty good for some and kind of fast for others. What is a good set time for them?" For whatever reason, it sounds a great idea to create photo slideshows to celebrate a special and unforgettable Christmas. 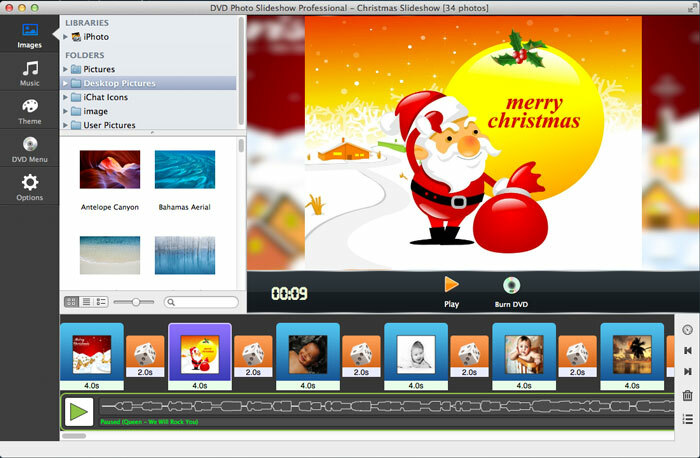 It is easy to find slideshow software for making Christmas slideshows. However, it is not easy to get one that fits all your needs. To create a decent Christmas slide show, you just get DVD Photo Slideshow to help you. It features dozens of transitions, themes and menu templates. It also lets you add background music, add text, edit individual slides, set Pan & Zoom effects, specify duration, and more. You can either encode your slideshow into a video file or to burn your slideshow onto a DVD disc. Now let me walk you through the steps to create an HD Christmas slideshow movie with DVD Photo Slideshow. In the Images tab, you will be able to browse all the pictures in your Mac. You can drag and drop photos from iPhoto library or other folders in your Mac to the timeline. Switch to the Music tab, and you will be able to add music from GarageBand or iTunes library to the timeline. You can load songs from other folders in your Mac as well. Check out this list of top 50 Christmas songs. Go to the DVD Menu tab, and you can set DVD title and subtitle, pick a DVD menu theme, and select menu background music for your slideshow. 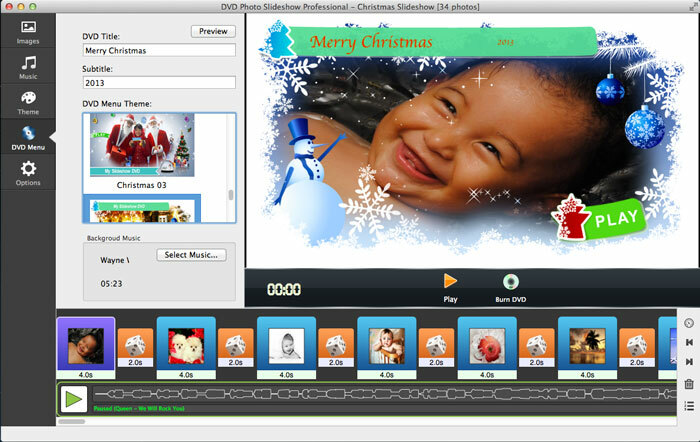 To create Christmas slideshow, just select one of the Christams DVD menu theme templates. 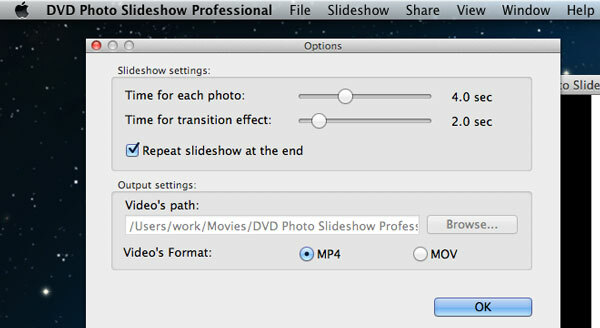 To encode Christmas slideshow to video, click menu DVD Photo Slideshow Professional -> Preferences... to go to the Options window. There you can specify the path and format (MP4 or MOV) for the output video file. Then click menu Share and choose Encode to Movie. In the Share Video window, you can write title and description and set Video Size (Medium - 360, Large - 540p, HD - 720p or HD - 1080p) for the output slideshow video. To burn Christmas slideshow to DVD, go to the Options tab where you can set TV system as NTSC or PAL and select DVD video aspect as 16:9 or 4:3. Then click menu Share and choose Burn DVD. A slideshow DVD disc will be created within minutes. 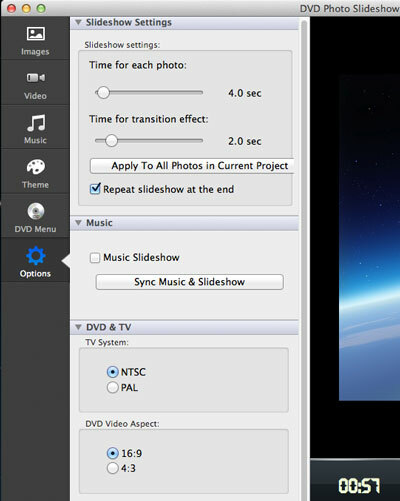 To learn more about how to apply transitions, customize menu, set Pan & Zoom, specify duration, edit photos, add text, and more, please refer to the user guide of DVD Photo Slideshow for Mac.